Hirshel: in the "נישט געזונטע יארען", after the stroke in תשכ"ח, the house of the Rebbe Reb Yoelish of Satmar, situated at 500 Bedford Avenue, Brooklyn, was considered a den of אינשי דלא מעלי, (certified by the ברך משה in his first Torah given to his new chasidim) ליצנות was rampant. 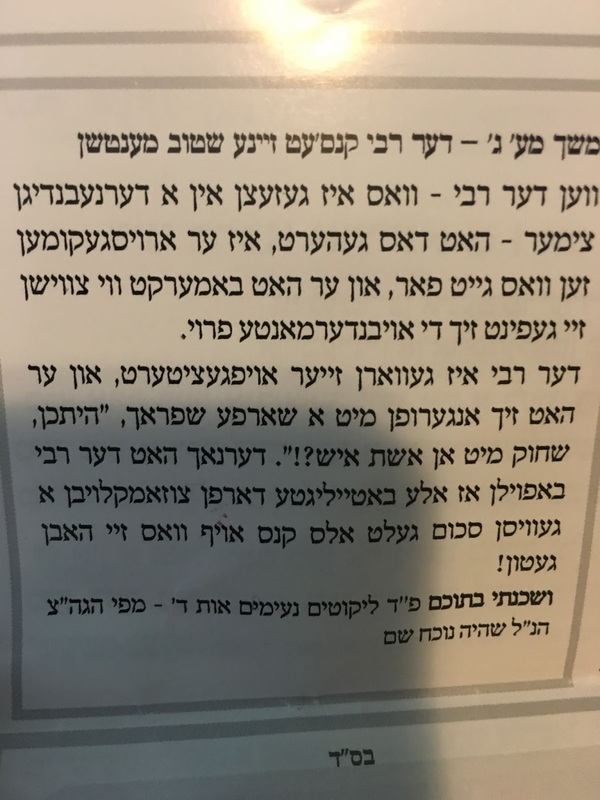 Reb Mottel Zilber פון סטוטשין interprets this מושב ליצים as העכערע ענינים... (he should be hired by the Reb Mendel Vizhnitzer שוואנצונעס Co.) obviously the Satmar Rebbe himself was part of the mood ----- ליצנות was the commerce of the day. Before davening and after davening. There was always time for a good shmooz. This Shabbos I chanced upon a pamphlet on שמירת עינים. Most of it is quotes from the רבי ז"ל. I'd say that the editor of this pamphlet isn't the sharpest tool in the shed. 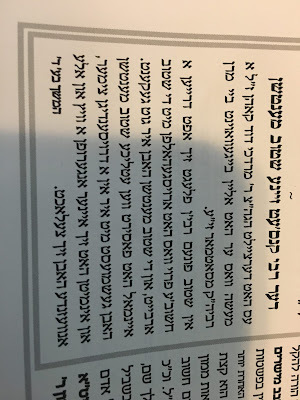 They put in a story of Reb Mordeachai Duved Kohn a משמש in the early years. 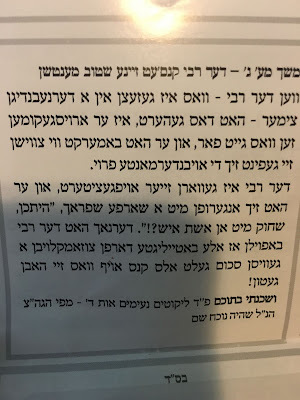 In the next room of Reb Yoelish's chamber there was a hangout of the guys, and some woman who was apparently the Rebbetzin's friend would also spend time there. The hangout tuned into raised voices of laughter, so much so that it was heard in the other room. So much so that Reb Yoelish had to walk in on them and rebuke them, being shocked that there was mingling and laughing going on with an אשת איש. I don't think there was another Rebbe in those days that had that casual an environment next to a Rebbe's חדר... I can't imagine R' Shaye Unger laughing and being casual with neither a male and definitely not a female, with the Skverrer Rebbe in close proximity. Via e: "the house of the Rebbe situated at 500 Bedford Avenue, Brooklyn, was considered a den -- the Rebbe himself was part of the mood". Judge not a "quote" by whence it comes but by whither it goes.."
We the people of Belle Harbor NY, Remember when the SR arrived here , He could than barley "walk or talk", that was less than two months after he fell ill, we watched him here in our city as he 90% miraculously recovered, but he never went back to 500 Bedford afterwards, They did build him a New House in Williamsburg where he resided occasionally on holidays or weekends. Therfore your "fake news" of "draining the swamp" is factual wrong for "many" obvious reasons. Hirshe'sl: "נישט געזונטע יארען" after the stroke in תשכ"ח "
So you trying to boost your ratings by joining "the swamp" while trumpeting that you're "draining the swamp" well good luck with that. Personally I think this is the chashivus of the SR. He was not an overwhelming personality, except when it came to his shitos. On a personal level, he did not exude arrogance and entitlement. קטן ודל: "after the stroke in תשכ"ח"
and for good measure, Who was his teacher for "community organising" was it bar yeuduh ? You write and i qoute Satmar Rebbe was part of the mood, this is the biggest בזיון תלמיד חכם I have seen in a long time. And is false .The Rebbe was very ill and his mood was down having lost much of his abilities. Take this post down immediately. P.s. I am not a Satmar chosid . eShigetz said: "certified by the ברך משה in his first Torah given to his new chasidim" ? "California Grazing, provides holistic land management and brush & weed control through "goat grazing" We can eliminate noxious weeds, restore native grasses, and address fire prevention" - Goat Roper. not at that time, but the point is that he was part of the letzonus mood when he was healthy. Not chas vesholom with women. NO HE WASN'T EVER. did alter ferd. quips like that I heard myself many times from him, mostly to me it was defuse the anxiety of people around his presence, or whatever it was, certainly not le'tzunis, maybe a geniuses. is Reb Aron a Shotah? a Letz ? a demagogue ? or all 3 combined? "האט ער זיך מזכיר גיווען לפניו ברמז עליו: י'פרח ב'ימיו צ'דיק [ישראל בן ציפורה]"
chusid: "The Rebbe was very ill and his mood was down having lost much of his abilities." אין זיין קליינעם (2 קאר גאראש) שול, איז אמאל גיווען א מסיבה של מצוה ש"ב, אין שלמה יעקב האט גיזאגט בדחנות לפני רב"י בעמקות ובדביקות, האט ער גיוואלט 'מרמז' זיין ברמז כל דהו, אוויא עס זעהט יעצט אויס "היינט צי טאג" דאס שטעטיל זיינע, האט ער דערמאנט בתו"ד דעם פסוק און אלה הדברים: "וקמת ועלית אל המקום אשר יבחר ד' אלוקיך בו.."
You made a big mistake with this post. You can laugh it off now but... Hashem yerachem ! Wow ! An interesting choice of words. 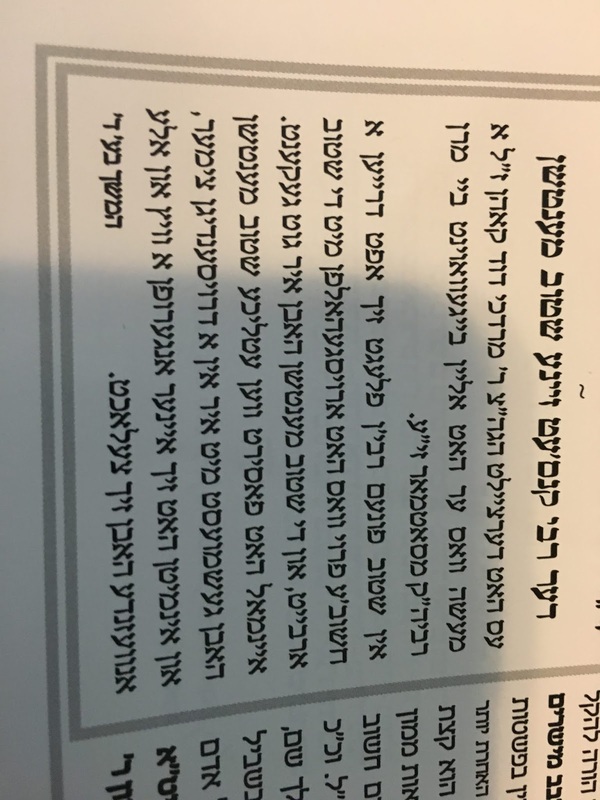 A society that claims that their Rebbe attending college is 'hechere inyanim' accuses another of שוואנצאנות. He supposedly set out his site to bash the Lubavitcher bashers, not realising that he has become the biggest Lubavitcher basher himself, by posting time and again his blasphemous ideologies, which is anti every Lubavitcher rebbe their ever was. So if you can't live up to the "Jones's standards" - (he is doing the best he can trying to), - than bring the jones's down to your level. it's much cheaper.. good luck with that. ps: it was the LR who handed continuesly sweets hand to hand, face to face and quipped with woman. hey lipa take a cold shower no shvitz for you today. Pheh tuna said: "Reb Mottel Zilber פון סטוטשין interprets this מושב ליצים as העכערע ענינים.., (he should be hired by the Reb Mendel Vizhnitzer שוואנצונעס Co.)"
I read a 'responsa' from the LR, (in short): Someone asking his advice, since he already "completed" his jewish studies he wants to attend now college to further his aacadamic studies.. The LR advised him not to go to college. the man protested and asked the LR: than why your honor you yourself went to college? the LR answered: It was a "mistake", and because of it, I know to tell you that No you should not go, don't make the same mistake.